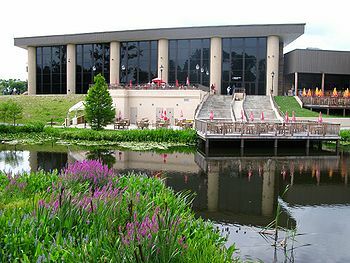 The Creation Museum and Family Discovery Center (known simply as the Creation Museum) is an educational facility that is owned and operated by the Answers in Genesis ministry (AiG). It is located in Petersburg, Kentucky, USA, near the Cincinnati/Northern Kentucky International Airport. 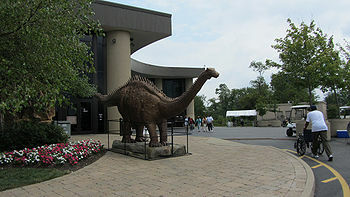 The creation museum, which opened to the public May 28, 2007, occupies a 70,000 square foot facility and cost over 27 million dollars to complete, all of which was donated. The curators had expected to see 250,000 visitors in the first year of operation. In fact, as of the end of February 2008 (eight months in operation), it had seen 300,000 visitors and was beginning to see the first heavy crowds of spring vacationers. These visitors have included Christian schoolchildren (including members of nearby Mennonite communities), skeptical antagonists, curious individuals, and sympathetic creationists. Altogether, 404,000 people visited the museum in its first year. Due to the opening of the Ark Encounter in July 2016, attendance at the Creation Museum in its first year nearly tripled the yearly average attendance, with the Ark Encounter itself hosting 1 million people. The key feature of the museum is its "walk through history" display. It begins with a description of the techniques of paleontology, and a contrast of the two differing worldviews that inform the evaluation of paleontological evidence. This is one of the most important displays that the museum has, for it delivers a key corrective to the worldview that evolutionary natural history museums commonly represent and expound. That corrective is AiG's constant message: that we all see the same evidence, but we interpret it differently, entirely on account of different worldviews. The authority of Scripture, from the writing of it to Martin Luther nailing his precepts to the cathedral door. The falling-away: from Tennessee vs. John Scopes (with details about John Scopes and Clarence Darrow) to Charles Templeton's loss of faith. Graffiti Alley: a sobering demonstration of the consequences of the abandonment of Scriptural authority, both at home and in the church. An explicit affirmation of the Creation story. Depictions of the Garden of Eden, Adam and Eve, the Fall of Man, and the dire consequences of that fall--including Cain's murder of Abel. The story of Noah and the global flood, including a simulation of the building of Noah's ark. The life-sized display of one percent of the ark's hull, covered with scaffolding, with hired workers applying the pitch, gives visitors an appreciation of the sheer size of the ark. From that display the visitor proceeds to a room having a demonstration of the magnitude and rapidity of the flood, and the likely appearance of the ark. Dinosaur Den, featuring life-sized animatronic dinosaurs. In fact, the museum features more than fifty models of exotic animals, and does not hesitate to depict dinosaurs and people living side-by-side. The walk-through ends with a presentation of a video feature, The Last Adam, that explicitly affirms the gospel of Jesus Christ and the overriding importance of His Mission to earth. After completing the "walk through history," the visitor emerges inside the museum's bookstore, which also has a lobby entrance. The Dragon Hall Bookstore could easily be a stand-alone specialty bookstore devoted to the Bible and creation, were it not located in the museum. The bookstore does sell a line of museum-themed merchandise, but that is only a small part of its business. The bulk of its wares consists of books, magazines, and DVD videos having an explicit creationist theme. Some of the titles, like James Ussher's The Annals of the World and Floyd Nolen Jones' The Chronology of the Old Testament, are highly valuable research aids. This is a planetarium with a modern 360-degree projector. By contrast, as a visitor stands in line to enter the planetarium, he or she can view the original Spitz A3P Star and Planet projector used and operated by NASA to train the astronauts of Project Mercury in celestial navigation. Currently an extensive botanical garden is under construction on the museum grounds. This garden currently includes a pond, several walking paths, a suspension bridge, and several sculpted hedges in the shape of dinosaurs. The museum complex is also the headquarters for AiG and houses the ministry offices, recording studio and resource distribution center. The museum also has classrooms for use by school groups, pastors and others. On any given day, AiG might be hosting a number of guest speakers delivering lectures to museum staff, guests, or both. The museum has two eating places: Noah's Cafe and Grill, which offers full meals, and the Plaza Cafe on the lower level, which offers snack foods and drinks, including drinks made from fresh-frozen fruit. The sheer size of the crowds that the museum has so far seen has prompted AiG to build another, larger eating facility. As mentioned above, the museum is surprisingly well attended and in fact is surpassing multiple records for attendance at museums of natural history in the United States and elsewhere. To accommodate these crowds, the museum is also building an additional exhibit hall that will devote itself entirely to the story of Noah and the Global Flood. Prior to its opening and continuing today, the museum has provoked a firestorm of protest from evolutionary organizations (such as the NCSE) and secular media. Protesters were present on opening day and online petitions have circulated. In response, the museum has its own special security force, with both regular and occasional K-9 patrols. The Museum welcomes faith-based groups and even agnostic and atheistic groups who wish to arrange tours. In August of 2009, the Secular Students' Alliance sent a contingent to the Museum for one such tour. By the account of the museum's curator, Mark Looy, the visit went well, apart from a few minor incidents of mockery and attempted disruption of a lecture. Mr. Looy has reaffirmed the Museum's willingness to receive all visitors and groups, regardless of their faith or lack of faith, so that persons who would likely never attend a church would receive the Gospel of Jesus Christ and a perspective on origins not available in most other museums of natural history. Exalt Jesus Christ as Creator, Redeemer and Sustainer through a safe, wholesome, family-friendly center for learning and discovery that clearly presents major biblical themes from Genesis to Revelation. This center will equip Christians to better evangelize the lost with a sense of urgency, through a combination of exhibits, research and educational presentations that uphold the inerrancy of the Bible. This center will also challenge visitors to receive Jesus Christ as Savior and Lord and to accept the authority of the Bible by providing culturally relevant biblical and scientific answers from a biblical worldview. For a detailed internal review by a museum visitor, see Opinion:A Godly Museum of Natural History. Ireland M, "Creation Museum Hosts Atheists for Tour, Exchange of Ideas, ASSIST News Service, August 13, 2009. ↑ 1.0 1.1 Personal interview by User:Temlakos of various members of the museum staff, March 28, 2008. ↑ Ham, Ken, Archive of Museum Updates, Around the World with Ken Ham. Retrieved October 28, 2007. ↑ Ross, Larry (September 15, 2016). Answers in Genesis reports strong attendance in first two months of operation for Williamstown’s Ark Encounter. Northern Kentucky Tribune. Retrieved July 8, 2017. ↑ Record Crowds as Creation Museum Celebrates 10th Anniversary. Answers in Genesis. May 26, 2017. Retrieved July 8, 2017. ↑ Wartman, Scott (July 7, 2017). Creationist parks still a potent draw for visitors and controversy. The Cincinnati Enquirer. Retrieved July 8, 2017. ↑ Ark Encounter Makes Enormous Impact in First Year. Answers in Genesis. July 6, 2017. Retrieved July 8, 2017. ↑ Smith, Lawrence (July 6, 2017). 1 year after opening, Ark Encounter's attendance and impact is growing. WDRB. Retrieved July 8, 2017. ↑ The artistic and educational merit of the title is debatable, but most visitors can find something admirable in its main idea. ↑ Phelps, Daniel. "The Anti-Museum: An overview and review of the Answers in Genesis Creation Museum," National Center for Science Education. Retrieved October 28, 2007. Note the subhead on the NCSE's site: "Defending the Teaching of Evolution in the Public Schools." This page was last modified on 8 July 2017, at 13:12.